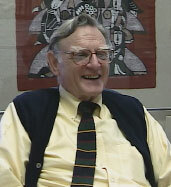 John Goodenough is Professor and Virginia H. Cockrell Centennial Chair in Engineering at the University of Texas, Austin. He specializes in the electronic and ionic properties of oxides. As a young man he volunteered to be a meteorologist during WWII, after which he studied physics at Northwestern University. He has worked at MIT's Lincoln Lab and at the Inorganic Chemistry Laboratory at Oxford University. His research straddles many fields. He received the Material Research Society's Von Hippel Award in 1989 for "distinguished contributions to the field of solid state sciences, where his insight, ideas, knowledge, and research have consistently drawn together the basic concepts of physics and chemistry in the conquest of wide-range fundamental topics." The solid state ionics field also recognizes Goodenough as one of the most influential scientists. Do read our interview with Prof. Goodenough. He has also delivered a talk with much of the same content to the Science and Technology Foundation of Japan. This page was written and last updated on 3 September 2001 by Arne Hessenbruch.